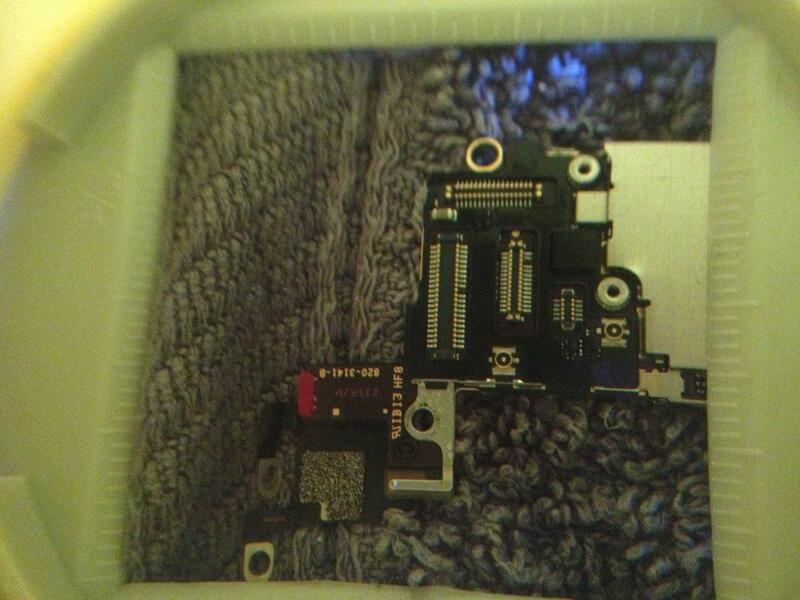 my Iphone 5 went diving in our pool last week. It was underwater for about 2 minutes. After drying it in vacuum with rice, everything worked except for the display backlight. It looks like 2 "pins" are missing in the "connector sockets", can you see it? Is it normal or am i right with my suspicion that it's damaged? And if, how can i repair that? Remove the board and the cover across from the board. Lets see what the components beneath it look like. Yes it does look like there are some issues with the pins, but it may be the image itself. Try to post a more focused one. Depending where or what is missing, you may be able to solder it with the right tools and skills. Besides the rice (which absolutely does nothing) did you clean it any other way? Did you replace the battery? What else have you tried? You did at least remove the board from the phone and removed the EMI shields? It does look like there is a pin missing from each connector. You can replace the digitizer and LCD FPC connectors, but it requires micro-soldering skills. My advice would be to send it off to a place that specializes in that. You can find a few listings on eBay offering the service. According to the general condition of the phone, the price of the repair would outmatch the phone's current value. Is there no "redneck" way to have a chance of fixing it? langeric 가/이 대단히 고마워 할 것입니다.